City architect Tony Gale says what the Bauhaus movement was to Germany and the Renaissance was to Florence, the sustainable building movement will be to Seattle. McCaw Hall's scrims will display images of the ballet and opera in the evenings, but act as shades on hot summer days. Like the Bauhaus movement of the early 20th century, sustainable design has the potential to rock the foundations of architecture. And the revolution, according to city architect Tony Gale, might as well take place in Seattle. Speaking before the Seattle City Council's Energy and Environmental Policy Committee last week, Gale said Bauhaus -- a 1920s German design movement emphasizing functionality and the economy of form -- changed the way designers looked at the built environment. Today, sustainable design is having that effect. "It's significant in terms of affecting the fundamental approach to building design and construction," said Gale. "Seattle is leading the country." Gale said Seattle was the "first city in the world" to set a goal in 2000 of adhering to the U.S. Green Building Council's sustainable standards. The city's original goal was to meet the Silver Leadership in Energy and Environmental Design level in 10 of its 24 upcoming projects over 5,000 square feet. 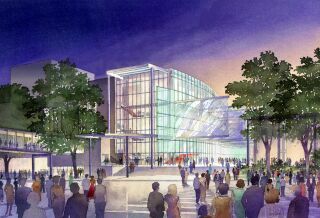 To date, it has met the Silver level in 14 of the projects, including the Justice Center, City Hall, McCaw Performance Hall, Central Library and Fisher Festival Pavilion. "Having 14 LEED projects is a huge success," he said. "The city of Seattle will be the largest single owner of LEED projects in the world." Showing his support for adoption of LEED standards, Mayor Greg Nickels today will put the first plant on the new Justice Center’s green roof at 10 a.m. The green roof is one of the key features making the Justice Center a sustainable building. "Having 14 LEED projects is a huge success. The city of Seattle will be the largest single owner of LEED projects in the world." What the Bauhaus movement was to Germany, and the Renaissance was to Florence, the sustainable building movement will be to Seattle, Gale said. In the late 1990s, during the biggest building boom since the Great Fire, Seattle seized the moment by adopting LEED goals for a number of upcoming civic projects. The city's Office of Sustainability and Environment estimated sustainable practices add 1.4 percent to the cost of a project, which is recovered within an average of six years. Annual savings in energy and water costs for the 14 city projects should be about $800,000. Gale expects eventually there will not be an added cost, as more designers become LEED accredited, and as projects use the more efficient general contractor/construction manager method, which allows the contractor to be involved early and work closely with the design team. In addition to being cheaper to run, sustainable buildings have the potential to decrease absenteeism due to illness, by using better ventilation systems. The city estimates absenteeism could be reduced by almost 20 percent. Seattle's new City Hall will use solar collectors to reduce reliance on natural gas. While local design firms such as Boxwood, LMN and NBBJ are charging ahead with sustainable designs for civic projects, on an international level architects such as Renzo Piano of Genoa's Piano Workshop have been merging high design and green design since the late 1970s in Paris and Berlin. Piano's 1998 Daimler Benz building was the first double-skinned, naturally ventilated high-rise in world, Gale said. Closer to home, Rem Koolhaas raised an additional $2 million for one of the Seattle Central Library's green elements: aluminum mesh in a triple-glazed curtain wall. The mesh will reduce heat gain, screening the building like a bank of trees on the west side of the building. The city's new Justice Center will use a thermal glaze buffer wall on its west facade to capture excess heat in the afternoons and exhaust it through mechanical assistance and natural convection. Used for the first time in North American, the thermal glaze in the winter will trap heat and lower heating bills. 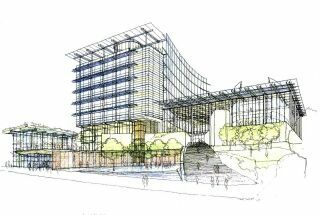 The new City Hall will also be environmentally friendly, using solar collectors to reduce reliance on natural gas. And McCaw Hall's scrims, while artfully displaying images of the ballet and opera in the evenings, will act as shading devices on hot summer days. Gale said Seattle and Portland lead the nation in sustainable building practices. Portland has 18 registered LEED projects, and Seattle has 17. Portland has a larger number of private projects, while the majority in Seattle are public. That may be changing. Gale will meet this week with Vulcan Northwest, which he said is interested in learning about LEED standards for commercial and residential projects in the South Lake Union area. The city has launched a pilot program offering incentives to help cover soft costs associated with meeting LEED standards for projects such as Vulcan's. The program would provide funding for research and assembling the LEED submission package. The city's Office of Sustainability and Environment later this month will release a report and cost analysis on the program so far. It will be on the Web at cityofseattle.net/sustainablebuilding.